Ad Astra’s rocket will travel ten times quicker than today’s chemical rockets while using one-tenth the amount of fuel. The VASIMR system would cut the trip to Mars by months according to Franklin Chang Diaz, a former MIT student, NASA astronaut, and now CEO of Ad Astra. 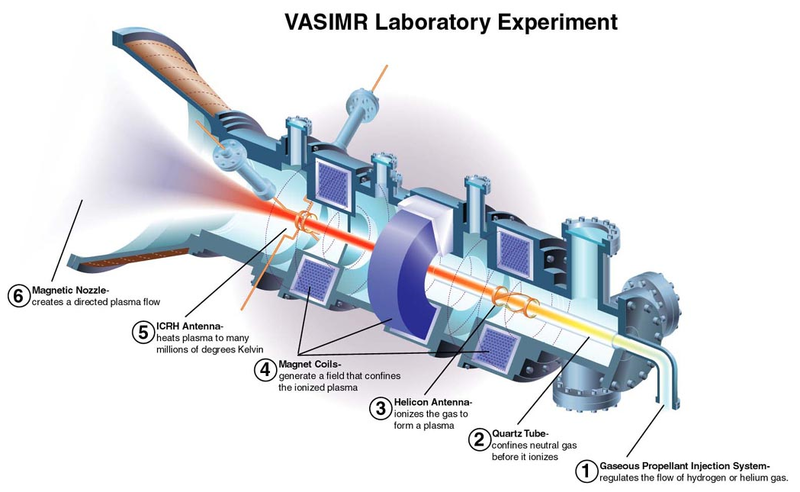 VASIMR heats plasma, an electrically charged gas, to exceptionally high temperatures using radio waves. The system then offers thrust by funneling the hot plasma out of the back of the engine. According to Diaz, VASIMR will save thousands of gallons of rocket fuel and tens of millions of dollars a year. This engine is truly amazing and can help us in exploring space a lot. Ultimately this will help us reaching the outer skirts of our solar systems. This is one of a kind. In the following video, Diaz explains in great detail the origins of space travel and why the magneto plasma rocket technology will transform space travel and exploration. months ago. Same speed two saturday nights running. l think it has already been tested. The Rocket isn't the problem. The problem is the power source for that little "RF Power" box in the diagram that allows the rocket to "use 1/10th the amount of fuel". If it weighs 100million tons then that rocket isn't going "10 times quicker" than anything. We don't HAVE a power source that can power this with a thrust/weight ratio that allows it's performance. We might be able to MAKE one (a nuclear reactor that we launch as payload into orbit and hope the rocket doesn't explode on the way up showering poisonous radioactive dust over everything downwind -- for example). But articles like this tend to gloss over the power requirements that chemical rocket fuels have built in as chemical energy. nuclear Power sources have flown for over 40 years. Both passive heat generators and actual Fission reactors. THIS article may not cover the power source, but numerous other articles have. Go to the NASA site to read up on the EXTENSIVE debate on nuclear material launching. Yeah really... RTGs are old news, and NASA just finished making a 10KW tiny reactor. Think all those probes are operating on solar power past Jupiter? Yeah no. Absolutely fascinating idea and concept. Now if we can harness matter and anti-matter in a plasma and use it for space travel even Zefram Cochrane would be amazed! He did it in 2063. I think Ad Astra can do it much earlier! Love it! 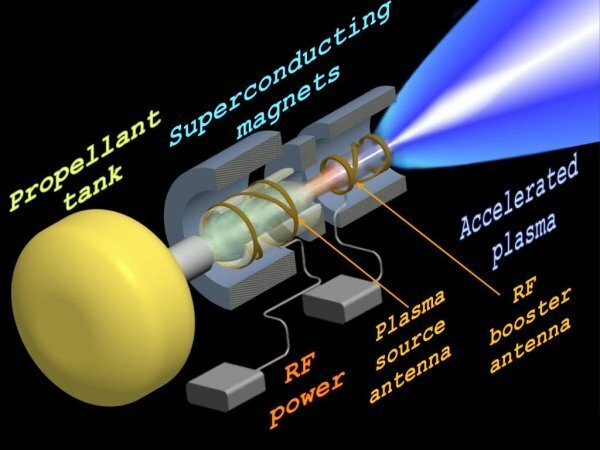 Using a matter/anti-matter reaction to produce plasma will not propel a spaceship faster than the speed of light. In fact, it wouldn't propel it at the speed of light, either. General Relativity has shown conclusively nothing with mass can travel faster in vacuo greater than the speed of light. The only conceivable way to travel faster than light speed (and this is pure speculation) would be to build a ship with a so-called Alcubierre drive. For such a drive to exist, though, would require a type of exotic matter no one has yet been able to show even exists. Thus, at this point in history, the idea of humans one day taking to the cosmos in starships is science fantasy. Now, hold on! While FTL travel isn't allowed, time dilation means that it's theoretically possible to make it from one side of the galaxy to the other in less than a single human lifespan, at relatively reasonable accelerations! Granted, 100k years would still pass on Earth and the technology for powering/sustaining that kind of vessel is likely a long way off, but...well, it took us 56 years to go from the first successful airplane flight to landing on the friggin' moon, so I'm not ruling anything out by 2100AD. What is the Physical top speed in km per hour and what (if any) time dilation affect will there be? I'm curious how the spacecraft with this type of propulsion will be braked near Mars. ALL spacecraft "Brake" by turning around 180 deg and firing their engines along the direction of travel. You just have to get the timing right. Haven't you heard of "flip and burn"? You should be watching the great show 'The Expanse' for tips like this. lol They have had this in a similar form since the 90's with the Aurora the runs on Methane gas . Anything you see thats shown to the public the government has had for at least 40 yrs. How long to Jupiter? Saturn? Neptune? Sending probes and robots is all fun and games, but sending people out that far and getting them back again would be straight up the most amazing experience I can imagine happening in our lifetimes! NNPTC's mission is to prepare safe and trusted Naval nuclear operators ready for follow on prototype training and, ultimately, service in the Fleet. I wish I could have built mine back in the 90's For the power requirements, multiple sources would be used. Solar w/capacitors and chemical turbines would be the simplest option if used for thrusters or light payloads, turbines for larger more powerful rockets w/capacitors used as starters. The suppression of technology is still rubbed in our faces. How come we're still using the internal combustion engine and all things related? They mentioned in the film that a plasma drive would be the diesel engine of the future - backward thinking, and at the same time appeasing the masses. Even though this is a quantum leap in terms of cost and speed it should have been in use a hundred years ago, five hundred years ago - give or take. Let's take off the gloves and start using all that hidden tech we know is out there. Even if this works, we still need a way to get out of the gravity well cheaply and efficiently.